WASHINGTON — Former business associates of Michael Flynn have told lawmakers that he traveled to the Middle East in 2015 as part of a private proposal to build nuclear power plants across the region, a trip that the former Trump administration national security adviser never disclosed during his security clearance process. In a letter released Wednesday, two top House Democrats reveal that companies involved in the proposal provided details of Flynn’s trip in June 2015 that suggest he also failed to report contacts with Israeli and Egyptian government officials. The lawmakers — Rep. Elijah Cummings of Maryland and Rep. Eliot Engel of New York — are now asking the companies and Flynn to provide the names and nationalities of any officials he met with during the trip abroad. The information released by the lawmakers is the latest evidence that Flynn didn’t fully account for his foreign contacts and business entanglements even though he was liable for possible federal criminal penalties for lying or omitting such information. Security clearance questionnaires specifically ask applicants to report any meetings abroad or contacts with foreign government officials that occurred in the previous seven years. As a former director of the Defense Intelligence Agency, Flynn maintained a security clearance. His last renewal was in early 2016. Flynn has been dogged by questions about his lack of disclosure of a Turkish lobbying operation and of foreign payments he accepted after leaving the military in 2014. Flynn also was forced to resign his Trump administration post in February after White House officials determined that he had misled them about the nature of diplomatic conversations with Russia’s ambassador to the U.S.
Special counsel Robert Mueller is scrutinizing Flynn’s foreign interactions as part of his probe into Russia’s meddling in the 2016 election and any possible coordination with Trump associates. Earlier this year, that investigation incorporated an ongoing federal probe into Flynn’s lobbying for a Turkish businessman during the final months of the presidential campaign. Flynn’s attorney, Robert Kelner, declined to comment on the letter. Flynn’s legal team has previously said that he’d like to cooperate with Congress but only intended to respond to subpoenas that compel him to do so. As members of the minority party, Cummings, the ranking member on the House Oversight and Government Reform Committee, and Engel, the ranking member of the House Foreign Affairs committee, do not have subpoena power. Cummings and Engel first raised concerns in June about Flynn’s 2015 Mideast trip after Newsweek reported that Flynn had worked with companies angling to persuade foreign governments and companies to join in a plan to build a cluster of 40 nuclear plants in the Mideast for civilian power needs. The lawmakers also seized on a comment Flynn made in congressional testimony in the summer of 2015, in which he said that he had just returned from the Middle East. Because of the potential for a criminal violation, the two lawmakers say they are providing Mueller with the responses from the companies. According to the letter and documents released by Cummings and Engel, Flynn’s Mideast trip was backed by ACU Strategic Partners, a U.S. firm that sent him to persuade officials to support a plan involving companies from the U.S., Russia, France, the Netherlands, Britain, Ukraine, Israel and several Persian Gulf nations. 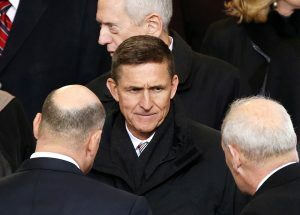 Dr. Thomas Cochran, an adviser to ACU Strategic Partners, told the lawmakers that Flynn was expected to press Egyptian and other officials to hold off on accepting a rival offer from Russia to finance and construct a smaller system of four reactors in Egypt and two in Jordan. Flynn’s Egypt visit “was to convince the government at least to postpone accepting the Russian offer to finance and build four reactors in order to carefully consider the ACU alternative,” Cochran said in his response. Flynn also traveled to Israel where, Cochran said, he sought to assure Israel that the project would be in its interest. The proposal has never gotten beyond the planning stage. But in his response, Cochran indicated that there could be support from the Trump administration, particularly in its effort to involve both U.S. and Russian interests. “The ACU project gives President Trump and Secretary (Rex) Tillerson a valuable private sector mechanism for helping stabilize and improve relations with Russia as well as helping accelerate U.S.-Russia cooperation in the Middle East,” Cochran said. In a separate response to the congressmen, ACU Managing Director Alex Copson confirmed that ACU paid Flynn’s travel expenses and wrote him a $25,000 check for “loss of income and business opportunities resulting from this trip.” But Copson told the lawmakers that banks records show Flynn never cashed the check. Flynn had previously not disclosed his compensation on his government financial disclosure filed earlier this year, but in August, he filed an amended disclosure that listed he had received more than $5,000 from ACU. Flynn also listed that he was a consultant to another company, IronBridge Group, which was connected to the project. An attorney for retired Rear Adm. Michael Hewitt, the chairman of IronBridge, confirmed to lawmakers that Flynn took the trip, but did not provide details of his foreign contacts. Thomas Egan, an attorney for ACU, said Tuesday that he had received the lawmakers’ letter, but the company had not yet decided whether it would respond. Michael Summersgill, an attorney for IronBridge, did not respond to a telephone message Tuesday seeking comment. Since the late 1990s, Copson has promoted a series of international nuclear-related projects that have not come to fruition. The House letter cites an April 2016 email forwarded from Copson to Hewitt and several others showing that Copson initially envisioned the U.S. and Russia as developing the reactor project. But turbulence in Syria and the Iran nuclear deal led Copson to propose bringing in other partners, including China.